Most of us are familiar with the works of Dr Seuss, from the childish rhymes of Green Eggs and Ham, to the Hollywood production of The Cat in The Hat. Less famous, but equally profound, is his 1965 tale “I Had Trouble In Getting To Solla Sollew”. The story is told by a young narrator who experiences troubles in his life and wants to escape them. He is encouraged by a passing traveller to flee to the city of Solla Sollew, “where they never have troubles, at least very few”. Over the course of his journey, he encounters an increasingly sensational array of new problems, including a broken down camel, a torrential Midwinter Jicker, and fighting a band of Poozers alongside General Genghis Kahn Schmitz. When he finally arrives at the city gates, he finds the doorman has been rendered helpless by a Key Slapping Slippard, dashing his hopes of escaping his troubles. Ultimately (spoiler alert), the narrator returns home to face his troubles, in the form of a big bat to fend off predators!! Of course, the moral of the story is that you can’t run away from your troubles. 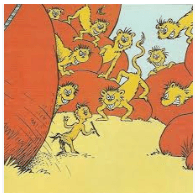 However, reflecting on the absurd series of hurdles the narrator encounters on his quest, you can’t help but wonder whether Dr Seuss supplemented his writing income with a job in M&A. As advisors, we are always looking for a Solla Sollew transaction – one where the perfect buyer turns up at exactly the right time, offers a great price for the business we’re selling, there are no hiccups during Due Diligence, and the transaction closes in a few weeks. Of course, just like the land where they never have troubles, the perfect transaction does not exist. Often business owners fall into the same trap as our intrepid adventurer. They convince themselves that the path to a transaction will be smooth sailing, underestimating the troubles they’re likely to encounter along the way. And they meet travellers who convince them of the same, typically in the form of friends down the pub who once sold their business for a motza (which is usually analogous to the gambler who only ever tells you about his wins). The reality is that there are always going to be troubles, but at the start of the transaction journey it’s impossible to predict them all. At InterFinancial, we’ve been lucky enough to never come across a Poozer or a Slippard. But some of the troubles we’ve encountered while advising business owners have been no less sensational. Surround yourself with the right team. It’s impossible to anticipate every trouble. However by assembling a team of experienced advisors (including commercial, legal and tax), chances are they will have seen something similar in previous transactions that can help mitigate the impact of troubles, and will be able to see the troubles coming and deal with them before they turn into a Midwinter Jicker!! By that Green-Headed Quail on the place where I sit. But I’ve bought a big bat. I’m all ready, you see. Thinking about selling your business or raising capital? Give one of our friendly advisors a call to learn how we can act as your big bat and guide you on the path to Solla Sollew! !